Our fellow staff, Edi and Isa, together with their three children Sara, Miriam and Daniel welcomed a new member into their family at the beginning of July: Nelson. "We already knew about the situation with the Dawn Refuge and we knew that it wasn't going to be able to continue after the long summer break. As you can imagine, these have been some long, difficult months for us and we've had to accept the news with a heavy heart, remembering many, many memories and special moments that we experienced during the last 10 years. One of the issues that worried us most was the placement of the children who were still living in the Refuge, and especially for Nelson. Nelson was the first child to arrive at the Refuge. At that time he had just turned five-years-old, and since there were no other children during the first few months he lived in our house. At that time our daughter Sara had just turned four and Miriam was not even a year old yet. Now, as a 16-year-old, Nelson is the only child of that generation who is still at the Refuge. The others have either moved out on their own or have gone to live with families. So, for him, the closing of the Refuge was the worst news he could receive. We've never seen our ministry as merely a job or a task, but rather a life commitment and we couldn't stand passively by, knowing that Nelson's main need was to have a family that he could depend on. Isa and I were quickly in agreement. despite the fact that we are very different in many ways we almost always agree on the really important decisions. We talked with our kids and proposed the idea of inviting Nelson to become part of our family, knowing that this would require sacrifice on everyone's part. Sara told us, "For me, Nelson has always been a brother," and the decision was made. When we spoke with Nelson and proposed the idea to him, he was only able to get one word out: "amazing." 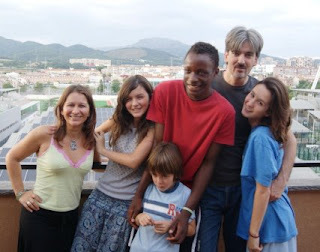 So now, since July 11, we are a family of six, three of which are teenagers!"